Hi Kasey, I would like to speak with you briefly to see if you're a good fit to coach me. Please contact me at your earliest convenience. At Change Works, all the Coaching I do Challenges the Status Quo I Believe in thinking differently about you. I believe that each person is a Unique and wonderful Being, and Deserves a Unique and wonderful Approach to Change.I am not your everyday Cookie Cutter Coach. Kasey Conrad has, for more than 30 years, been an observer of human behavior, and an agent for life affirming change. She holds certifications from NGH, NFNLP, IARP, NAHA, ACHS and the NCBTMB as a Trainer, Personal Development Coach and Therapist in Hypnosis, Neuro-Linguistic Psychology (NLP), Reiki, Aromatherapy and Neuromuscular Therapy (NMT). Kasey is an accomplished and results-driven professional offering a unique combination of Holistic Therapeutic and Training skills, along with vast Business Management experience. Her mission is to help others develop ways to help themselves make lasting and effective life-affirming change by using proven easy to apply methods. Having conducted thousands of one-to-one client sessions, she accomplishes this by empowering individuals through personal development coaching, career, performance and wellness coaching. 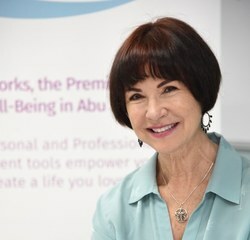 Bringing over 30 years of experience, to a wide range of International clientele in the USA and the UAE, Kasey is now working in Abu Dhabi, guiding individuals toward desired change and self empowerment, as well as creating performance management, professional development, and leadership development programs for small businesses and charity organizations. Have you worked with Kasey? Tell your friends! Kasey doesn't have any reviews yet. Kasey hasn't submitted any articles.